Hello. Brian? Brian Atwood? You don't know me, but may I just say that not only are you extremely HOT but you shoes designs leave me completely weak in the knees! 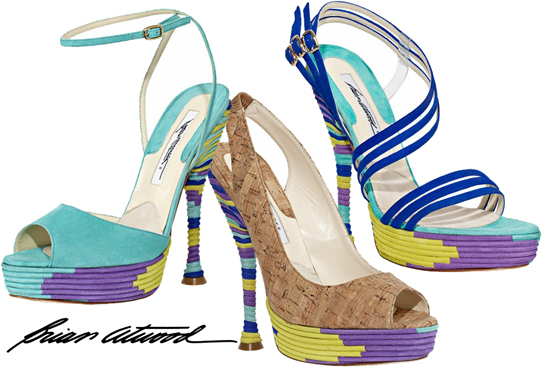 You manage to design shoes that are not only stunning but complement every woman's foot. Just having your shoes on make so many woman look 100x more gorgeous. Of course though, I just so happen to fall in love with three designs from your 2011 Summer collections that I can not seem to find anywhere online!! Why do I always fall in love with the hardest to find shoes?? Like these (here) Miu Miu! On to these Brian Atwood heels. When I saw these three shoes they instantly screamed notice me and made me feel like running around in a bikini and sarong along a palm tree sprinkled beach. I'm also thinking that just maybe one of these could almost fill the hole in my heart that the Miu Miu polka dot heels left since my dream of owning the Miu Mius will never happen. My only problem is, if I am able to find these, which pair should I get? They are all fun and unique in their own way. I really want a pair I can wear with jeans or dress up in...help? Bloglovin' (HERE), Twitter (HERE), or Google (HERE)! I'll be doing a giveaway very soon for only my followers!